Tom Prentice is a young, not so hot screenwriter living near Hollywood, not entirely enamoured of the “false intimacy” of the movie industry there and certainly wary of the constant cajolement of his aspirations by those with no interests other than their own, “Hollywood was a place where you could die of encouragement”. We first meet Prentice grieving in a morgue, he’s there to identify the oddly emaciated body of his estranged wife, Amy. It quickly becomes obvious to Prentice that his once manic-depressive wife might have perished due to rather more nefarious circumstances than mere weight loss and narcotic dependency. Shirley’s secondary protagonist here is a reformed alcoholic and drug addict – working at overcoming addictive behaviors, now a minister involved in the rehabilitation of others mired in the seemingly endless and miserable cycle of dependency. This is Garner, sole parent to his teenage daughter Constance, a bubbly girl of whom he has high hopes she’ll manage to avoid the pitfalls of self-destructive drug use. With the introduction of Ephram Pixie, “a squat little man, with a soft wheel of fat around his middle, his oversized head mostly bald,” Shirley’s narrative takes an unnervingly steep nosedive into the weird and horrifying. Ephram’s motivations are driven by an addiction to something far more frightening than man-made drugs, a supernaturally extracted narcotic of the deeply monstrous kind. And then things get seriously weird. The author rapidly builds a narrative so fleet-footed in pace that by the time he’s properly established his secondary characters, the reader is already figuratively gripping the vibrating seat-restraints of a literary rollercoaster whose admirably unrelenting momentum is by turns both exhilarating and terrifying. Shirley’s thought-provoking story of a reality that exists just below the level of human perception is -at times- used as a slightly cumbersome metaphor for the dilapidation of the physical and the spiritual, but the compelling narrative rhythm he adopts here doesn’t allow the reader to worry too much about the overt symbolism. There’s a quote by the noted American author and essayist John Rechy used at the opening of ‘Wetbones’ that speaks of the writer’s obvious shared perception of the nature of Los Angeles, “You can rot here without feeling it.” Shirley’s had a diverse career thus far, a screenwriter (you may have heard of ‘The Crow’), Bram Stoker award winning novelist, singer, songwriter (he’s penned lyrics for the band, ‘Blue Oyster Cult’) and continues to produce works of bewildering and challenging creativity. Arguably there’s a patina of verisimilitude evident in ‘Wetbones’, a work steeped in ruminations on the vapid nature of Hollywood and the debilitating impact of interminable drug abuse and partying culture. In less talented hands this social commentary element is often prone to authorial pretension, open to the dangers of being wearisomely preachy and over-bearing. Shirley skirts this tendency for the most part, nicely presenting the reader with a sub-text that doesn’t scream out its message, but simply and effectively whispers it throughout this imaginatively rendered story. Clive Barker, whose recommendation for this novel reads as follows, “John Shirley is an adventurer, returning from dark and troubled regions with visionary tales to tell. Wetbones is a wild and giddy ride, confronting the reader with marvels and horror in equal measure.” And Barker’s right on the money here. I envy those who have not read this excellent tale yet, as it’s this reviewer’s contention that it’s one of the most rewarding ‘horror’ experiences you’ll have had in quite a while. The outline listed above is, to use the tired cliché, ‘only the tip of the iceberg’ in terms of the horrific delights that await the discerning reader, but if you’re strong of stomach and eager to be taken for a riveting and unnerving literary ride then you can’t lose picking this one up. 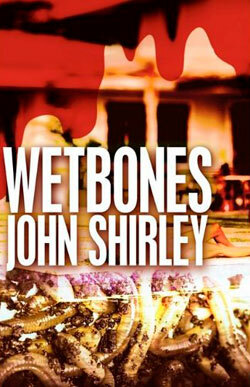 It’s been a while since I’ve read anything by John Shirley, but you have me interested in Wetbones. You won’t be disappointed, Wayne. Book’s a treat. Thematically, it’s like the movie ‘They Live’…on steroids. I ordered Wetbones from Amazon a little while ago. It was the last paperback they had in stock. After I finish the John Irving novel I’m presently reading, I’ll read Phases of Gravity by Simmons, and then Wetbones, unless I get Joe Hill’s new vampire novel first. So…heh-heh…I can expect a comparison review tomorrow night, Wayne? James, With Amazon’s free shipping, it sometimes takes from seven to ten days to get an order, plus Wetbones was part of a larger order involving two DVDs that don’t come out till Tuesday. I might get the order the first week in May, then I have to read the book. Time. Everything takes time, which I don’t have much of. Sorry for the lazy sarcasm, Wayne. What’s the title of the John Irving book you’re reading? I never read John’s earlier novels before The World According to Garp, so I’m going back and reading them now. I’m presently on The 158-Pound Marriage. Don’t worry about the lazy sarcasm. I’m dealing with a lot of things right now from bad health to close friends passing away to a stressful job and the slowing down of my writing. My mind is on other things, and I’m not thinking too clearly. Old age. Sorry to hear that, my friend. Keep swinging. Always. Have only read one book by Irving and that was ‘A Widow For One Year’. Funny, moving and deeply resonant. I’ve been meaning to catch up on more Irving. Let me know what you think of ‘The 158 Pound Marriage’. Loved “A Widow For One Year” by Irving and “Cider House Rules” and “A Prayer For Owen Meany”, and even his newest book, “In One Person.” I’m about halfway through “The 158 Pound Marriage,” and might stop reading it. It put me to sleep yesterday. I also want to finish Owen King’s new novel, “Double Feature,” and then prepare myself for his brother’s (Joe Hill) newest book, “NOS4A2,” which should be coming in this week. So much to read and write about, and so little time to do it in. James, I finally got Wetbones in from Amazon. Now, I have to find the time to read it. You’re in for a serious blast of horror, my friend. Hope you get a big kick out of it!